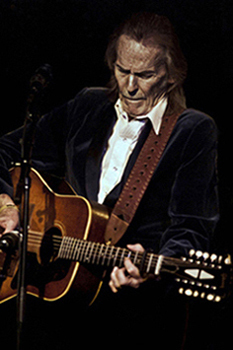 For those not that familiar with Lightfoot, his first record was released in ‘66, with real success hitting in ‘70 with “If You Could Read My Mind,” which made the upper register of the charts. Originally called “Sit Down Young Stranger,” which was the title of the record it came from, it was changed at the urging of Stan Cornyn, an executive of artists’ services at Gord’s major label, Warner Brothers. The song struck a chord with folk fans at a very strong time for the genre. Gord’s popularity peaked in ‘74 with the number one hit “Sundown,” affording him big time fame. However, with the decline of folk music in the latter ‘70’s, Gord wasn’t able to sustain his success, and his output decreased from then on. Fortunately, time has been good to Gord’s career in the last couple decades, after he was able to transition into being a heritage artist, so to speak. He has a devoted following in the form of a mostly mature audience. On this night in the country’s biggest market, and contrasting completely to the hustle bustle and noise of a crass Times Square just outside, something interesting occurred. This kind man from The Great White North gave his people the essence of what I sense they wanted. That was a low key, personally written and calming reflection of a much different and simpler era that will never be again. It gave pause for thought, at least for me, and brought some palpable and welcome humility into the room.